After a stressful day of waiting for the 1st attempt by baliffs to enter Dale Farm travellers site – which certainly would have been repelled – residents and their supporters could relax for a couple of days thanks to a rare positive intervention on the part of the travellers from a high court judge. Having arrived at Dale Farm on the night which many residents feared would be their last, my anxiety about heading into this situation at the last minute was certainly justified – it was clearly going to a fraught and upsetting day for the residents and anyone who witnessed/ resisted people – including elderly widows and the seriously ill being thrown out of their homes. Of course, Bristol No Borders had been mobilising for resistance to the planned eviction for 2 years plus – and others for much longer, but this was certainly not going to make it less traumatic. Those who had set up “Camp Constant” a couple of weeks before had done of a good job of creating a good organisational infrastructure – and more importantly making sure that the residents were happy with all the resistance that was planned. The one thing that immediately hits you when you get their is how happy the residents are to have you there – their appreciation is very touching – they said they were certainly are not used to such support. With the massive media presence, the two helicopters circling almost continuously as well as constant reports we were getting of baliff movements in the compound next adjacent to the site all led to a very tense atmosphere. A few people had decided to stay in the homes of those who were too ill or frail to move – and who had requested people to wait with them in their homes. This gave some of us the chance to get to know some the residents better- as well as provide them with support. 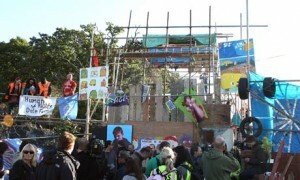 It also was slightly surreal as we were watching the rolling mainstream coverage of the planned eviction via the telly. Despite the tension, people were organised. For obvious reasons, I won’t go into details of this but suffice to say any eviction was (and will) be very very difficult to carry out. It seemed things had come to a head at around 1pm : when we got the news of bailiffs and police approaching the gate, whether they hoped to gain entry at this point I am not sure but they spoke through a megaphone. as you would expect, their message was drowned by the shouts of derision and insults from inside Dale Farm. They then left. We told later that they had voiced concerns and delivered a letter regarding the scaffolding tower which is blocking the only vehicular access to the site. We took this as preliminary move, which would be shortly followed up be the first ‘proper’ attempt. We waited…and waited. What was going on ? Surely, they wouldn’t start an eviction this late in the day. Then a first a small cheer, followed by a larger one went up as we received the news of the injunction which prevents any move to evict till Friday. The news was greeted with what might be thought of as disproportionate celebrations since it was only a reprieve till Friday. However, given the tension filled day it was a a relief that the fight would be at least be extended for another week – and a hope that the other legal challenges would extend the it further. However, We have to assume that interim injunction will only last till Friday, so it would be great if people could get down there for then. Moreover, even if there is a favourable decision again on Friday, its very unlikely that it will remain for long. Dale Farm residents and their supporters have many things in common – one of them is a total lack of faith in British “Justice”.